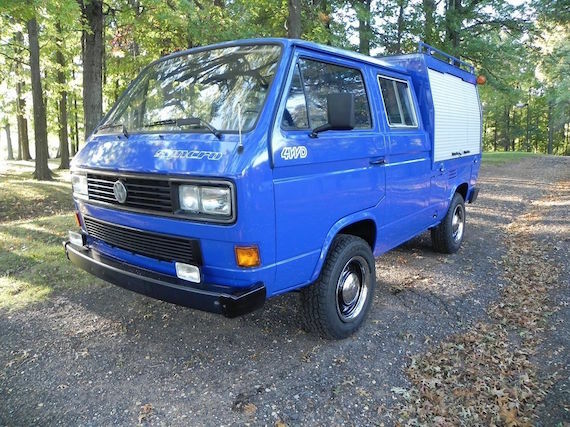 Coming from what appears to be the same New Jersey importer/seller as yesterday’s Golf Country is another Syncro special, the beloved Transporter DoKa. 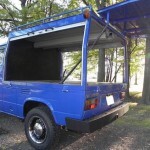 This one eschews common add-ons like lights, bullbars, and bumpers for a unique aluminum rolltop utility body over the bed. The rest is just clean, straight, and like-new. 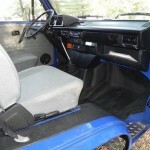 Bucket seats up front give a slightly more comfortable look to the interior than the common work-truck bench seen in DoKas, and from the roof to the undercarriage and the under-bed storage bin in between. 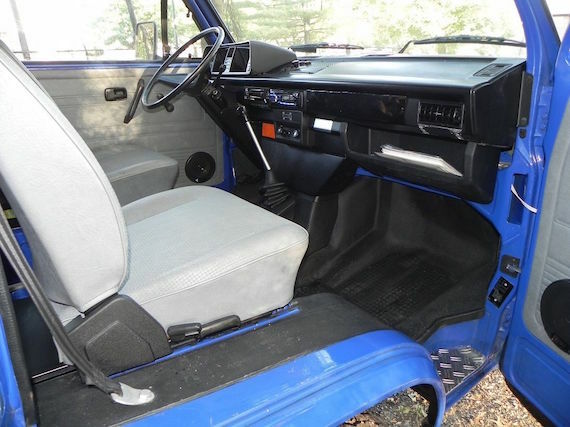 One thing I can’t figure out is the zippers in the headliner; any ideas, readers? Overall, it’s as nice as T3 VWs come without too many frills but plenty of capability. 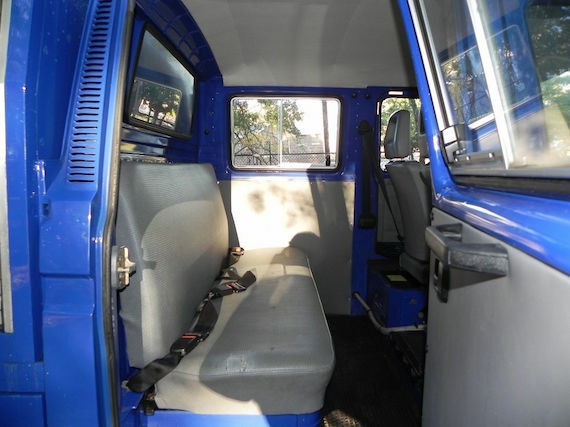 With no-reserve, we should get an interesting look at how hot the market is getting for the now easily-importable DoKa Syncros. 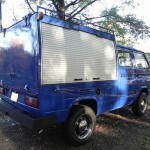 1990 Volkswagen Doka SYNCRO 4WD. If you are looking at it than you know what it is. Extremely low documented 23,279 km (That is only 14,465 miles). Front and Rear Axle Lockers. 2.1 Fuel Injection Engine. 5-Speed Manual with Low Range. Brand-New 16″ Wheels and Tires. 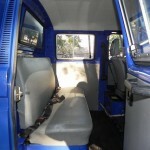 Custom enclosed utility body that is extremely useful. 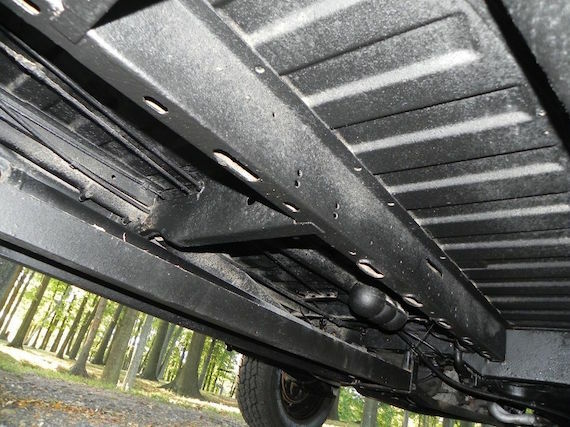 Truck Runs, Drives, and Looks EXCELLENT. Pretty much as nice as they come. You will not be disappointed. Free and Clear Title in Hand. 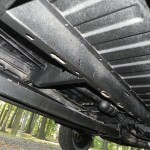 Please feel free to come and inspect this truck prior to bidding. This is NO RESERVE sale. Highest bid wins. HAPPY BIDDING! The fact that this seller is putting these cars up with no reserve blows my mind. 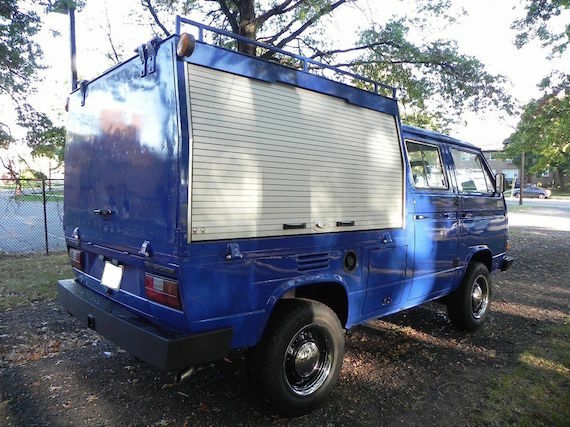 We’ve featured a couple of comparable Doka Syncros here recently, priced at $55k and $65k respectively. Neither has sold at that mark, perhaps indicating that the newly-removed importation restrictions are undercutting these seller’s hopes of huge profits. 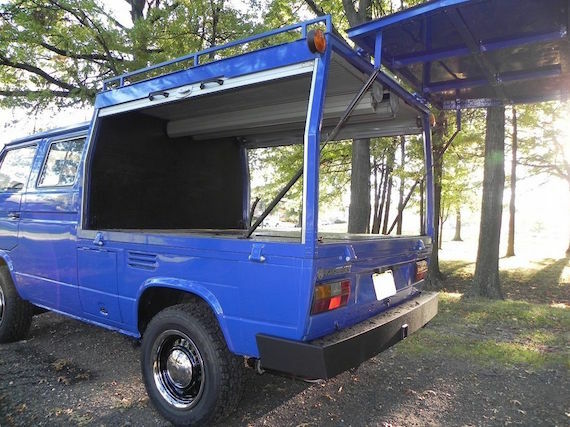 With no reserve on this unique example, we should get a look at what the eBay market thinks is a fair price. Wherever it lands, I think we can mark it as a baseline value for a nearly perfect, like-new DoKa Syncro. 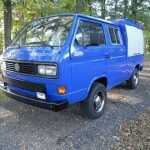 Tagged 1990, 4WD, DOKA, Syncro, T3, Transporter, VW.